I had to visit the St. Vital Library yesterday and I happened to go past the shelves that hold the books for sale. This one was on the shelf and for 50 cents I couldn't pass it by. 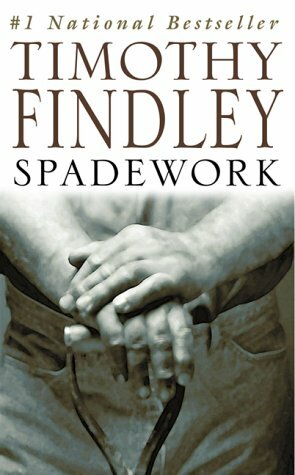 I've lost track of how many of Timothy Findley's books I have read. Just when I think I've found them all another one pops up. However, that's not a problem because his books are always interesting and thought-provoking. I didn't think this was his best but it was good. All of the action takes place in the summer of 1998 in the town of Stratford Ontario. Those of us who are old enough to remember that time will also remember the big news story involving Monica Lewinsky and President Bill Clinton. That story is referred to a number of times and in a way it is analogous to the story in this novel. Griffin Kincaid is an actor about to turn 30. He has been married to Jane for eight years and they have a seven year old son. Griffin is performing in two plays in the Stratford Festival and he is hoping to be given an contract for the next year. Jane is an artist who works in the props department of the Festival. She also has an independent income from her family in Louisiana. Jane thought she and Griffin had a good marriage but this summer Griffin has become remote, morose and finally moves out of the house. Jane thinks he must be having an affair with his costar in Much Ado About Nothing but the reader (and the rest of Stratford) knows he has been seduced by the director of the play, Jonathan Crawford. Crawford uses the threat of not casting Griffin for anything next season to bring him to his bed but Griffin seems to enjoy it once he has first succumbed. Meanwhile Jane is lusting after a Bell repairman with the body of a Greek god but would not jeopardize her marriage for him. Lost in this situation is Will, Jane and Griffin's son, who fortunately has devoted nanny/cook/maid Mercy looking out for him. I had a hard time accepting the premise that a man who is gay would essentially blackmail a straight man into his bed and that the straight man would let it happen. I know Findley was gay and possibly he knew of situations like this but I have found that gay men have usually suffered abuse themselves and wouldn't dream of perpetrating it. I left this book on a bench in the formal garden . This release is for the 2018 Canada Days release challenge. Every year BookCrossers release Canadian books into the wild to celebrate Canadian writing.